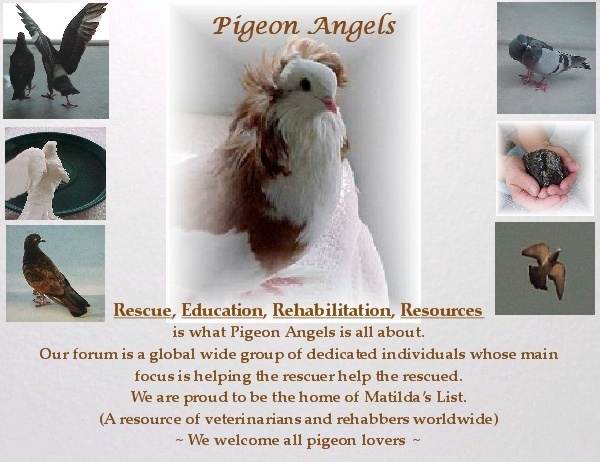 I received a call on Friday from a dog rescuer, my go-between for a pigeon rescue last year. She contacted me because a dear friend (and fellow animal rescuer) had become very ill and could no longer care for his animals. This gentleman has fifteen beautiful Fantails and Mookees. I called him and made arrangements to meet on Saturday morning. Upon arrival, I found the pigeons and chickens (100+) without water and with little food. We cleaned the water bowls and gave the birds fresh water and food. 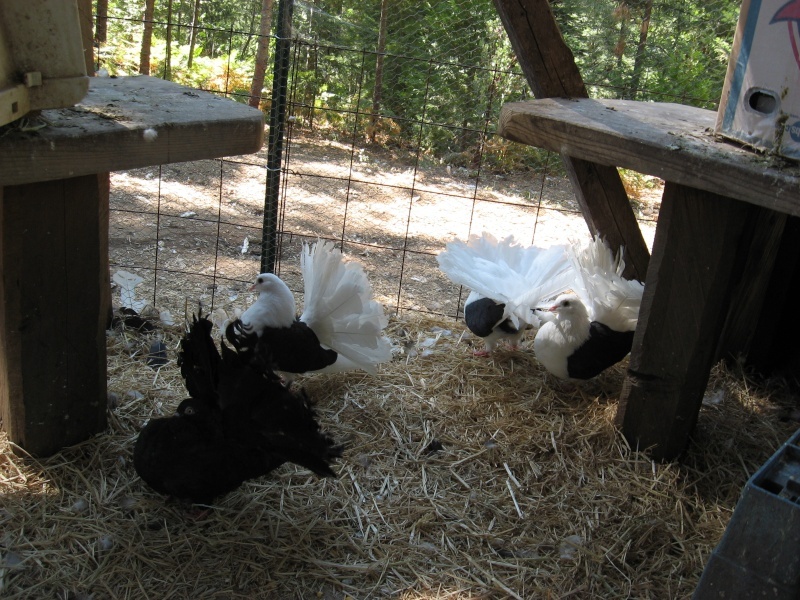 He also has rabbits, dogs and three, long-feathered geese (great watch dogs!). The dog rescuer is taking the chickens and dogs on Monday. She will help get the rabbits adopted too. I told the gentleman I would be back on Tuesday to assist and hopefully get the pigeons to a better place. When we got home, the first thing I did was to call Charis. I sent her pictures I took (see below) and she felt the birds needed to exit there soon. Currently, my isolation room is filled with three ill birds and a disabled feral that my brother gave me last weekend. Additionally, we are installing a pantry in our garage and the commotion would be to stressful for the birds if I set up a cage in there. I woke up on Sunday morning and there was an e-mail from Charis sent Saturday night at 9:45p.m., telling me she had found a place for all the birds. This was in about a three-hour timeframe. I think Charis has a reference book the size of "War and Peace!" And, the dedication and motivation that drives her is unbelievable. I can always depend on her and the insights she provides. I consider her a dear friend in my pigeon world. I plan on meeting the person who will foster the birds this Tuesday at the gentleman's home. I will eventually take a couple of the birds once they're provided some TLC. The rest will go up for adoption to good homes. They are quite beautiful and would be a great addition to anyone's loft. I'll take some better pictures once they arrive at their new rescue home. I will update everyone on their progress. Again thanks to Charis and Pij-n- Angels! Actually Joe...you have done the hard part... because you were there. The easy part was mine...I wrote emails and made phone calls. Thanks for posting this about this situation, Joe. First and foremost, I'm very sorry to hear the owner of all these animals has become ill.
Secondly, thank you so much for taking such quick action by getting the ball rolling to get these guys into a suitable situation. The birds you have posted photos of are stunning. Everyone involved has displayed the true meaning of amazing teamwork. Many . s you are! Yes, indeed! We will definitely be waiting for an update. They're just beautiful. Thank God you were able to find a home for them Charis. I agree with Birdbarn. Your resources are something else. You always find a way. GREAT JOB!!! Here's a quick update on our rescue. Sorry, it has taken so long to respond back. All twenty pigeons were rescued last Tuesday. Charis's connection, Stephanie Stewart from Sierra Wildlife Rescue, took all the birds. The birds are now on medication and resting comfortably. Stephanie drove over two and a half hours to assist us. She is a very devoted person and I enjoyed working with her. Stephanie might be interested in taking some birds. I think she might become a new piji mom. You just never know. Thanks again to Charis for making the connection and Stephanie for driving hours to help these lovely birds. 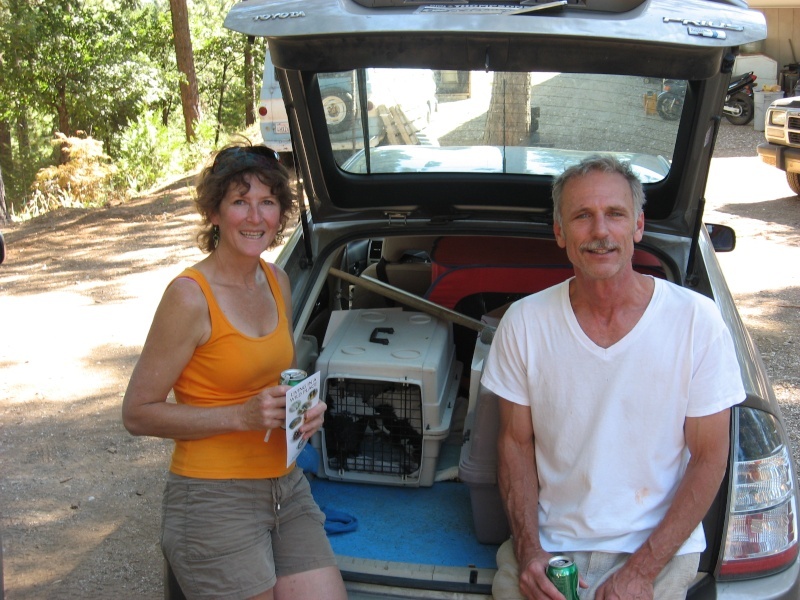 Here is a pic of Stephanie and myself after loading the birds into her Prius on a very warm day. Thanks for the wonderful update, Joe. to all involved with this rescue. True s you are!! A special Thank You to Stephanie for all her travel time. Thanks for the update...I love that picture. It sure sounds like you all did a GREAT job. I just love happy endings and you've created just that for each and every one of those innocent animal souls. Beautiful birds! Wonderful job everyone! Stefanie here from Sierra Wildlife Rescue. Finally I got some time to get online here and take a looksie. Actually it turns out that I took home 20 birds. About half are fantails and half are mookees. Most were a little thin but not too bad. I treated them all for Cocci right off since their droppings were a little suspicious but this also could have been due to improper diet. Looks like they were fed chicken scratch for awhile. Then a few of the fantails developed Canker so I isolated the one that developed plaques and the rest got treated as well. Once I got them settled in the flight cage, boy did they get busy! I started finding little eggs everywhere! ha ha. Poor things! then the weather turned much cooler and they all started to molt. They still look a little ragged especially the Fantails. Actually the Mookees are looking pretty good even in a molt. They are getting lots of goodies and eat better than I do!! Overall the Mookees are looking very healthy but the Fantails are struggling along. I really need to start rehoming these pretty birds. I don't have the best accomidations for keeping this many birds on a long term basis. I'll start to post some photos and I really hope I can rehome most of them. I will keep a few, but I'm getting quite a collection pijis so I must be careful not to get overloaded so I can continue to provide room for injured rescues. 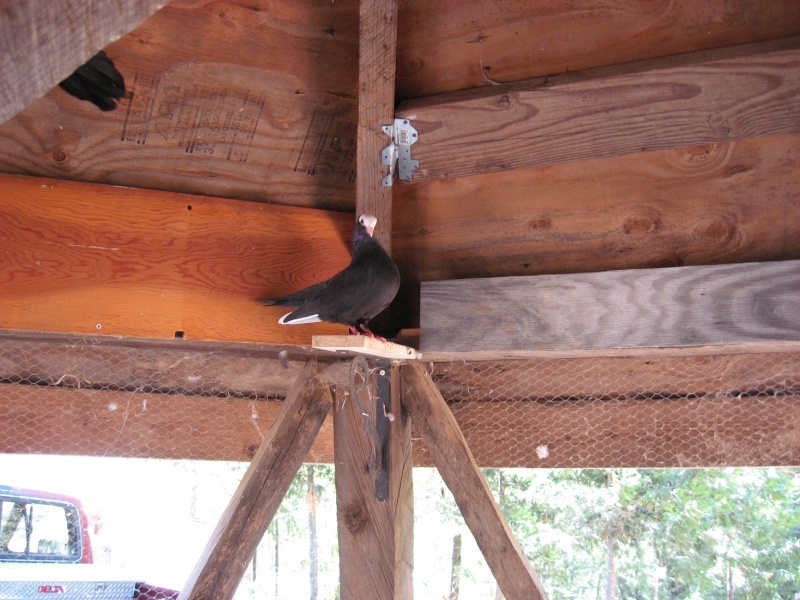 When I get more time this winter I hope to build a nicer loft since it looks like I'm quickly becoming a pigeon enthusiast! Please pass on the word and let me know if you are interested in adopting any of these sweeties. It's great that you've joined our wonderful group. You truly are a . The teamwork and coordination on this mission between Charis, Joe and you was top notch. I'm so glad to hear the pijjies are doing well. We will do whatever possible to get those sweet ones a fabulous forever home. We look forwad to the photos. We love photos!! I'm so glad you joined us. I'm delighted the birds are doing well...thank goodness for you and Joe. I'm l;ooking forward to the pictures. I do have some ideas for homes. Hi Stefanie, welcome to the club! What a great story and most important - Happy ending! Thank you so much for helping those birds. Please keep us posted.